Ninety years ago an aviation disaster marked the end of the UK's military airship activities. On the afternoon of 24 August 1921 thousands of people in Hull witnessed the R38 airship explode and plummet into the Humber Estuary. The craft was on a test flight from the nearby Howden airbase, before being accepted into service by the US Navy. Of the crew of 49, only five survived. Many of the victims were buried in a mass grave in a city cemetery. The R38 was commissioned towards the end of World War I. It was planned to be the first of four ships that could patrol far out to sea for up to a week at a time, to combat the German U-boat threat. It was a giant of the sky, 695ft long (212m) and 85ft (26m) high. To help with its performance the fuselage was made from lightweight metal, a decision which later proved to be its undoing. It was based at the huge airship base at Howden, East Yorkshire. At its peak at the end of World War I it was the biggest airbase in the UK, covering over one sq mile (2.6 sq km). It was home to more than 1,000 staff and 80 airships. Aviation historian Kenneth Deacon, who has written three books on the Howden airbase, said it was so busy that locals used to say there were more airships in Howden than cars. The war ended and the economy took a downturn, so the plans for a fleet of airships were scrapped. Construction had already started on the R38 and a deal was struck with the American government to buy the airship for use by the US Navy. The ship was completed on 7 June 1921 at the Shorts factory in Bedfordshire. 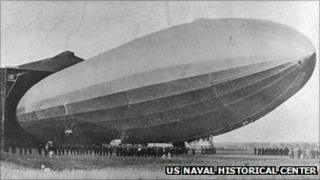 Two weeks later it headed to Howden, where a detachment of US Navy personnel were waiting to test the airship then fly it over the Atlantic to its new base. There was a problem on the first flight when some of the struts on the fuselage bent, a problem that took a month to fix. On 23 August 1921 the airship left to carry out flight tests over the North Sea. The plan was to fly it to another airship base at Pulham, Norfolk, but on arrival the base was shrouded in thick fog, making a landing impossible. The R38 was flown back out over the sea for more tests. The next day its crew tried to land again at Pulham but the fog had not lifted. Its captain decided to return to Howden and carry out more tests on the way. While over the Humber, high-speed turns were tried. The stress on the fuselage was too much and the craft broke in two, causing a large explosion, which blew out windows in Hull. It crashed in flames into the Humber just off Victoria Pier. People went out to the wreckage in boats in an attempt to rescue the crew - a brave act as the Humber was alight due to burning petrol from the engines. Mr Deacon said the haste to get the airship delivered had led to a fatal lack of testing. "There hadn't been enough trial flights done on it. It should have done about 150 hours and in fact [it] only did about 40 hours flying," he said. "The Americans were in a hurry to get it to go back to the States and the British government were in a hurry to get the money, because the R38 was going to save the airship industry." The disaster effectively ended the military's interest in airships. The Howden base was closed down and the buildings and equipment sold off. Cows now graze in the fields where the airships were based. The giant hangars built to house them are long gone. Only a line of poplar trees mark where the 750ft (229m) long structures, large enough to hold six Howden Minsters, stood.